MapPress is a plugin which adds Google Maps and pin points to your ClassiPress theme via short-codes or action hook on the home page, listing page, and search page. The map will list all listing posts with category wise colorful icons and you can change icons from category add/edit page from wp-admin. On individual pin points, visitors can click to get the listing titles with a link to the detail page, address, and business directions. 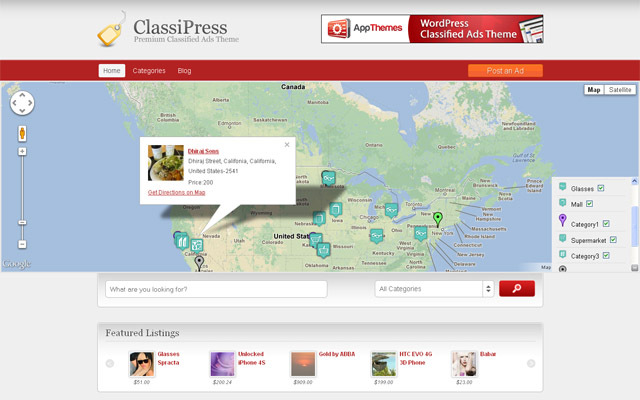 This plugin works with ClassiPress theme only. It is compatible with WordPress Multisite. View the demo | Get Map Category Icons. Map code add manually in header.php file is not needed. If you have already added please remove the code and see plugin settings to manage map display settings. See plugin settings to show/hide map from home page, category pages, tags pages and search page. Add Google Map API settings related instructions from plugin setting added. Create new Google Map API related instructions from plugin setting added. Multiple ads on same address not display properly – problem solved – now all ads with same address will be display in slider mode. Multiple ads on same address – solved for home page, category, tags and search map. Popup display good for small screen devices. 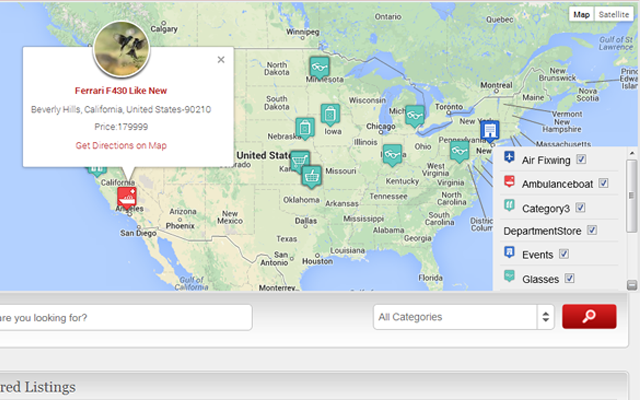 Category, tags and search map will display in grouped map so nearer map can be found easily. What Google Map Version we use? Is Google Map Group (cluster) facility added? 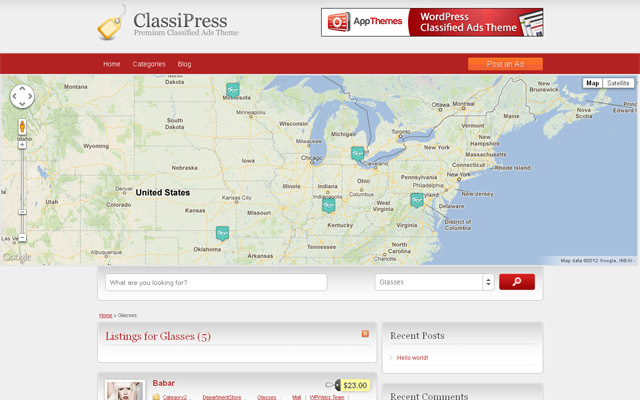 What Version of ClassiPress Theme & Wordpress Theme Support? ==> Plugin support all major later version of theme & wordpress. How to add google map for Home Page? ==> Get readme.txt and php code to add the map for home page as well for listing & search page is given there. Just get it and place in header.php file after header “div” close. How to change/add Icon for category? ==> Go to wp-admin > Ads (left sidebar) > Ads Category > add/edit category > you can see the option “Google Map Icon” where you need to insert full URL of Your Icon. You can upload icons via Media Library and get the icon URL. How to set map Height & Width? How to control Home page categories display? ==> You can set home page categories display from plugin settings, manage categories option. Select your category, you want to display. — You can add google map by shortcode. Insert the code in post/page/listing editor content. — Set width & height like :: [mappress_gmap w=100% h=400px], Refer readme.txt or plugin settings page for more detail. Make settings as per you want to display map for home page, category page, search page etc… and all other settings…. Read Usage, Notes & Developer Notes Carefully. Important note : After version : 1.3.0 (1st Aug 2016) >> map code add in header.php file is not needed. If you have already added please remove it and see plugin settings to manage map display settings. — Changed listings lat & lng for google map settings changed for each ads. — Added CSS to enhance map look. — Plugin settings update, removed nu-necessary options. — To solve above problem we have added option (wp-admin >> from plugin settings) to enable or disable the google map api url, in case if you face that problem you should select the checkbox and disable the map api so map should work ok for your site. 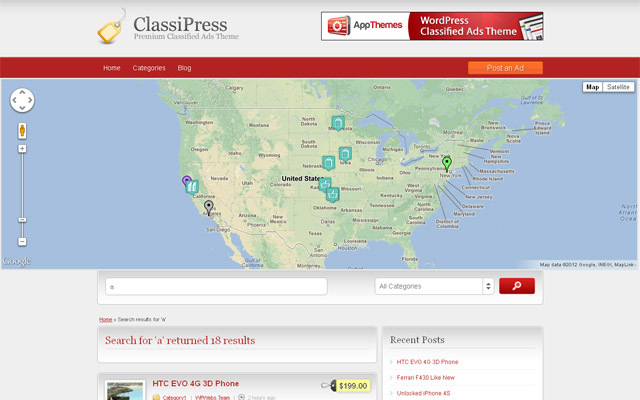 — Hidden plugin google map api as ClassiPress version 4.0 theme already added. — necessary settings as per needed. — Added map width & height option for mobile devices so you can set different height & width for computer & mobile devices. — Plugin settings center latitude, center longitude and zoom not affected on change, Problem solved. — Map display on mobile show/hide new option added from plugin settings. — Map width & height change option added from plugin setting. * Category map – on popup image not display. 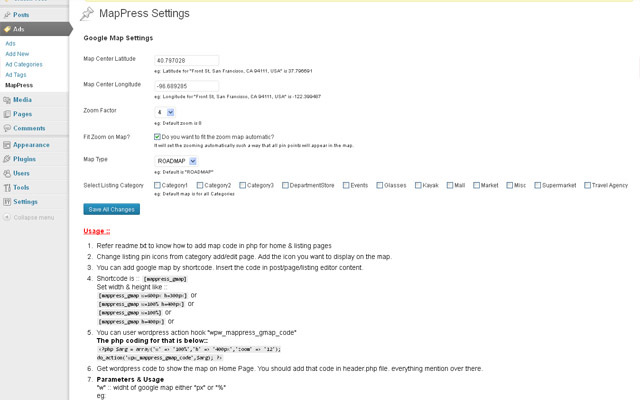 * New Options added for map dispaly >> Now no more manually add code in header.php file. * See plugin settings to show/hide map from home page, category pages, tags pages and search page. * Add Google Map API settings related instructions from plugin setting added. * Create new Google Map API related instructions from plugin setting added. * Multiple ads on same address not display properly – problem solved – now all ads with same address will be display in slider mode. * Multiple ads on same address – solved for home page, category, tags and search map. * Some design related changes. * Popup display good for small screen devices. 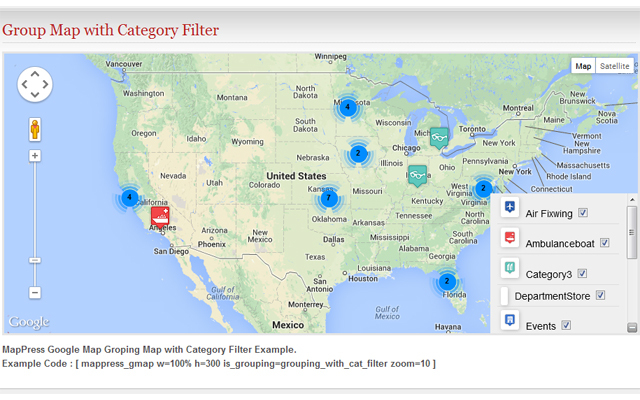 * Category, tags and search map will display in grouped map so nearer map can be found easily. * Auto Upgrade settings related settings done. — category selection/filter menu on map shifted from right to left so now you can see the map zoom option clrarly. MAIN FEATURE : Added Group (Clustered) Map Feature. You can manage related settings from wp-admin > plugin settings page. — add multiple category map via shortcode. I’ve managed to set this plugin up OK, but it took several days of emailing the author about different parts, namely thr Google Maps API Key and the actual map itself as it was positioned over the Atlantic Ocean every time it opened. I don’t live in the middle of an Ocean. Eventually I found that the person who places the ad needs to be precise when giving their address so the map knows where you live. Now it works every time you look at it. Not a bad plugin over all. I installed MapPress a few days ago, smooth installation and it worked instantly. For some reason I couldn’t get other free map plugins to work on my site. I’m somewhat of a beginner and had some trouble figuring out how to add MapPress icons and setting up map sizing but I eventually figured it out. My recommendation is for better documentation for non-experts to set up and customize. Having said that, it is working good for me and I’m happy with it. The problem is multiple Google Map API call on single page multiple time, none of google map will work for this page. To solve the problem remove those API url from other code and place in a single file. Great plugin, some initial issues but Vipul helped resolve. THANK YOU! Initially I had some issues with this map working with my site, but the developer was responsive and eventually worked out the issue (some conflict with my site) and updated a new version to work for me. Thank you very much. It now works great and I love this plugin. A wonderful feature on my site! This plugin is absolutely awful, It doesn’t work out of the box, hard to find where to set the location when creating and editing ads, impossible to display the map for the single ad. About the coding is horrible, Impossible to read and follow the logic, POOR coding standards, and everything fitted in two files, hard to read and hard to customize. And lack of filters!! How is this possible in a Plugin made for a theme which relies on hooks for everything?? Absolutely unfinished and raw option. I even refused to return the money, when I saw that this option is useless and complicated to install. It is a pity the lost time and money. J’avais des problèmes avec autres plugins.Il a fonctionner de suite. I had problems with other plugins.Il has run away. This plugin brought a great added value to my site for a little financial investment. Timewise, it took me only about 10 minutes to get it installed and functional. A potential enhancement could be to adapt the list of returned objects in the search when changing the zoom area on the map. Great plugin! I can see why some of the beginners would have trouble setting mappress up. the readme.txt lacks some details for a smoother install. But those with some html experience will be fine. Aside from that seems to do the job well. I’ll have to follow up in a few weeks once i get some feedback from the clients on my site. I was unable to configure it, I find the lack of more tutorials with step by step information for beginners like me. They enter the code, but I see enough details to set it up and add the parts of code needed to work, I think I should do it more specific for people like me with almost no experience. If I can help I would appreciate. works good but makes your site slow..!! other then making the site slow..is not so easy to install..you have to go to the css files to make it work..i wish i never wasted my money on this thing. Map markers persist even after ads have expired. So if you leave expired ads on your site (for SEO purposes), your map will soon be over-crowded with out of date map markers. Long ad titles do not auto line-break and so can create very wide info-balloons. A search function would be nice. There is already a WordPress plugin called MapPress (which I have also bought), so it would have been better to have given it a unique name. I have purchased this plugin, and work perfect. But, can I show only Featured Ad (sticky) in the map? I have buy your plugin map press and installed on my network. The plugin is functionally correct but when I install it I have some problem in other sites on my MU wordpress. Fatal error: Call to undefined function cp_get_geocode() in /homepages/12/d581937092/htdocs/wp-content/plugins/mappress/map_functions.php on line 224. Cantina you help me ? Where ist here the Problem. I buy classpress and mappress but if I edit the homepage (ad list homepage) and add the shortcode dont work. Work only in new page with template standard. The shortcode of mappress dont work in homepage of classpress, work only in new page. You can set width & height as per your wish. The shourtcode should work for all page content automatically. Not sure about your problem. I will check and correct if any such problem. thank you for all its updates, good job. If you can see the demo with featured slider is working ok. It seems like it is child theme problem and if you want to solve the problem, you should provide me wp-admin access so I can check it from wp-admin. A plugin that adds additional Google Maps to your JobRoller theme.